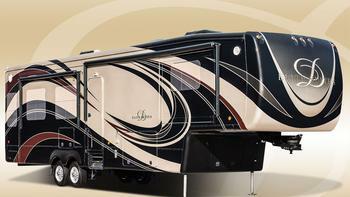 DRV Suites is recalling 7,465 model year 2014-2015 Tradition, 2014-2016 Full House, 2006-2016 Elite Suites, and 2013-2016 Estates fifth wheel travel trailers. The vehicles have front side reflex reflectors located above the maximum height of 60". If the reflector is located outside of the required area, the visibility of the vehicle by other drivers can be reduced, increasing the risk of a crash. DRV has notified owners and will provide a new reflector to install in the correct location, free of charge. The recall began July 21, 2017. Owners may contact DRV customer service at 1-260-562-3500. DRV's number for this recall is 99.02.05.